The pioneers of photography, Fox-Talbot and Daguerre, revealed their photographic processes, the salted paper print and the daguerreotype respectively, in the year 1839. However, photographic practice and experimentation had long preceded that year, as the 19th century was a period of much photographic experimentation. The National Library of Scotland holds in its collections an interesting image with the inscription “The first photograph I ever saw, 1835, taken by G. Froment at Paris” (Figure 1). 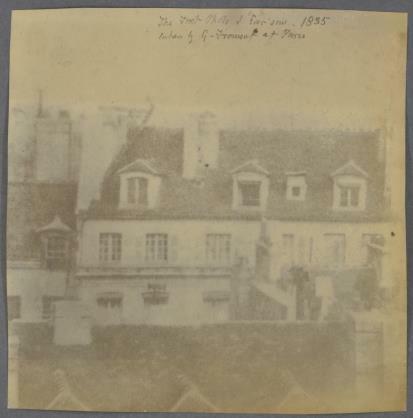 The photograph (MS.3241/214) depicting Parisian rooftops, belongs to the collection of the engineer James Nasmyth (Figure 2) and can be found in a portfolio together with some of his drawings, sketches and photographs. The inscribed date is four years before Talbot and Daguerre officially announced their processes, making this photograph a potentially rare testimony of early photographic practice. In 1990, the journal of the Scottish Photography Bulletin (now Scottish Society for the History of Photography) published an article about this photograph by Larry J. Schaaf, renowned historian of photography and Director of the William Henry Fox Talbot Catalogue Raisonné. Professor Schaaf undertook detailed research into the origins and history of the photograph. His article investigates the potential connections between James Nasmyth and Paul Gustave Froment (the photographer whose name is inscribed on the photograph), suggesting how it might have ended up in James’ portfolio. Paul-Gustave Froment was born in Paris and became a prominent mechanic and instrument maker. He studied in the École Polytechnique and also spent time in Manchester. 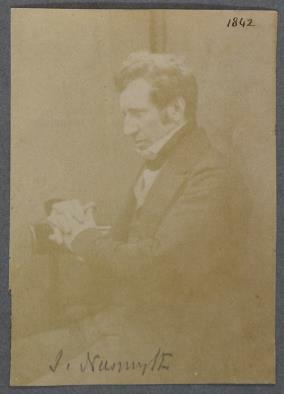 Although his photographic practice is not widely known, he worked on experiments to chemically fix photographic images, and he published his results at the Manchester Philosophical Society in January 1839 We were interested in this photograph because of its photographic chemistry as well as its history. At first glance it looks like a salted paper print, but microscopic examination reveals that the tone and texture of the image are different from the other salted paper prints found in the same portfolio. Instead, it seems possible that this is a direct positive print. Introduced by Hippolyte Bayard in 1839, examples of this process are rare. The rarity of the photograph and its potential unstable nature prompted us to investigate further. 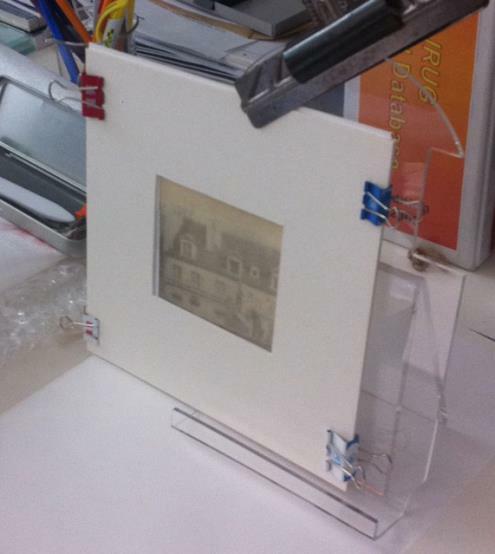 In November 2016 the library’s conservation department, together with the scientific department of the National Museums of Scotland, initiated a research project to learn more about the print’s chemistry and the photographic process, with the aim of understanding in more depth its deterioration and planning for its optimal preservation. This would help extract more information on its origin, and eventually verify the written date. During the first stage of research, Froment’s photograph and two others from the portfolio were taken to the laboratories of the National Museums Collections Centre. Jim Tate and Lore Troalen, Conservation Scientists at the National Museum of Scotland, analysed the print. Their expertise, combined with the analytical equipment at the NMS Conservation Science facility at Granton, provided important information about how the print may have been made. Non-destructive XRF spectrometry was used to identify the inorganic elements present in the print. Despite the similar results in all three prints, Froment’s photograph revealed an unusual distribution of silver throughout. This indicated that the combination of chemicals or the process used was different to what is seen in salted paper prints. The analysis also showed that the print is likely to be more unstable and may fade or darken when exposure to light is not strictly controlled. Making our own direct positive prints and comparing them with the original was deemed the best way to verify the process. After delving into photographic history, a number of Hippolyte’s Bayard recipes were found. 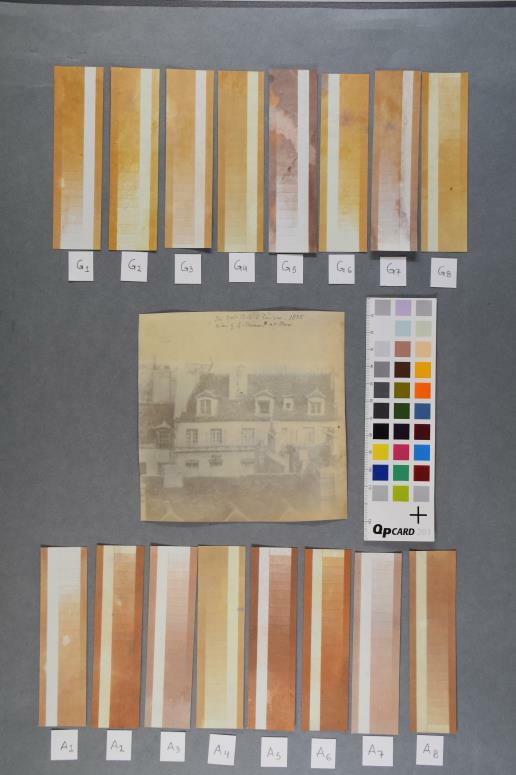 These were used to create a range of samples at Stills Centre for Photography by Library’s Photographic Collections Conservator Ioannis Vasallos and the Photographic Conservation Intern Stephanie Jamieson under the guidance and help of Brittonie Fletcher, alternative processes photographer. Different combinations of the recipes were used in an effort to explore different variations on the process. The sample prints were visually compared with the original and were taken for analysis at the National Museums Collections Centre. A group of the samples were also taken and analysed at the Getty Conservation Centre. The results of this analysis were compared with those from the original and showed similarities in elemental composition, reinforcing the hypothesis that it is a direct positive print and one of the earliest processes. This initial research has paved the path for further investigation of the chemistry of the print. The next steps could involve analysis of the print’s paper substrate and investigation into its light sensitivity using information from the newly made sample prints.